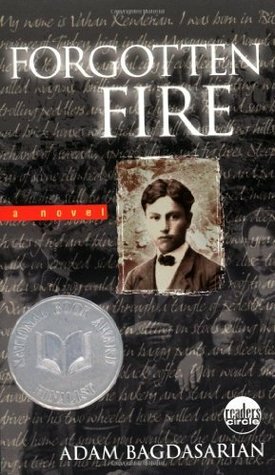 Blending magical realism and lyrical free verse, this is an intense survival story of three siblings caught up in the horrific events of the Armenian genocide of 1915. It is 1914, and the Ottoman Empire is crumbling into violence. Beyond Anatolia, in the Armenian Highlands, Shahen Donabedian dreams of going to New York. Sosi, his twin sister, never wants to leave her home, especially now that she is in love. At first, only Papa, who counts Turks and Kurds among his closest friends, stands in Shahen's way. But when the Ottoman pashas set their plans to eliminate all Armenians in motion, neither twin has a choice. After a horrifying attack leaves them orphaned, Shahen and Sosi flee into the mountains, carrying their little sister, Mariam. Shahen keeps their parents' fate a secret from his sisters. But the children are not alone. An eagle named Ardziv watches over them as they run at night and hide each day, making their way across mountain ridges and rivers red with blood.